Taste! Taste! is dedicated to everything we love about Sonoma County: good eats, delicious wine and craft beer. The Active 20-30 Club of Sebastopol, that raises money to help underprivileged children of West Sonoma County, host this food and music event. Held at Sova Gardens in Sebastopol, May 12. Tickets are $40-$50 at www.facebook.com/events/272631173233773. 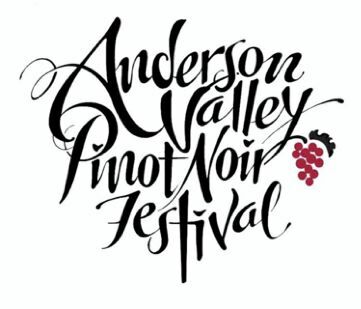 21st Annual Anderson Valley Pinot Noir Festival This year’s event will be held Friday through Sunday, May 18-20. The big news is that the festival has moved to Camp Navarro, with on-site lodging. Fortyfive wineries will be pouring at the Grand Tasting on Saturday. A Winemaker Dinner has been added Saturday night at the venue’s lodge. Winery open houses will be held on Sunday. All-event pass is $425, 2-day combo ticket is $220. Tickets on sale now at www.avwines.com/pinot-noir-festival. IPNC Featured Foreign Wineries Announced Vintners from Austria, France, New Zealand and South Africa will be attending the International Pinot Noir Celebration in McMinnville, Oregon, July 27-29, 2018. Full weekend tickets are $1,295.00. To view the list of participating foreign wineries or to register, visit www.ipnc.org. Third Annual Willamette: The Pinot Noir Auction The Willamette Valley Wineries Association held this trade event on April 7 at the Allison Inn & Spa in Newberg, Oregon. 78 lots of one-of-a-kind Pinot Noir wines and 3 collaborative lots of Chardonnay were offered from the 2016 vintage. The lots sold for a record-setting $737,000, exceeding the 2017 auction totals by 56%. The sale brought in over $800,000 including revenue from ticket sales and sponsorship. All money raised funds marketing and educational activities of the Willamette Valley Wineries Association. The top-selling Pinot Noir was a five-case lot of Antica Terra “Alder Creek at $33,000. Five cases of Zena Crown Vineyard “Barrel and Foot” Pinot Noir brought $24,000, five cases of Alexana Estate Winery “By a Landslide” Pinot Noir brought $20,000, and ten cases of Hyland Estates “The Perfect Pair” Pinot Noir brought $20,000. Santa Barbara Vintners Festival A Grand Tasting of wines from over 100 wineries, superb food from local foragers, farmers and restaurants and live music. The 36th Annual Santa Barbara Vintners Festival will be held Saturday, April 21, at River Park in Lompoc. General Admission is $70 ($55 for guests living in Santa Barbara County, $100 for early entry). Visit www.sbcountywines.com for more information and to purchase tickets. Lompoc has a new hotel, The Hilton Garden Inn, that offers modern amenities and guest rooms, as well as the on-site Valle Eatery & Bar restaurant. New Book Release: Decoding the Grape: Oregon Wine Country Stories Author Ken Friedenreich moved to Oregon after a 34-year layover in Southern California. He liked Oregon wine so much, he moved to Oregon to write about it. 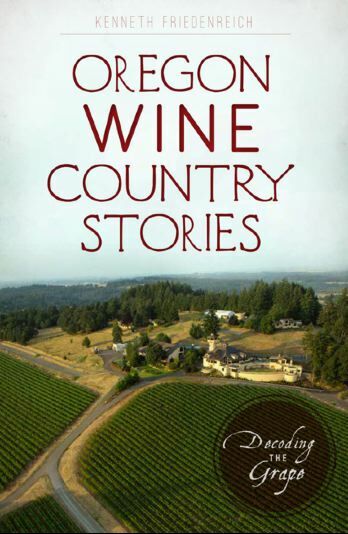 The book offers a snapshot of the wine business in Oregon, or as Ken says, “A one-stop crash course in working on your taste memory instead of your abs or rock climbing skills.” Nearly 400 wineries were visited and wines sampled for this both erudite and humorous book. The book is available this spring from Arcadia Press and Amazon. The book's website is www.decodingthegrape.com. Two Buck Chuck Launches Organic Pinot Noir Charles Shaw Winery, commonly known as “Two Buck Chuck,” has created a line of organic wines including a Cabernet Sauvignon, a Pinot Noir and a Rosé. The wines are closed with a twist-off Helix natural cork. The wines will be sold at Trader Joe’s priced at $3.99. Seeking the Holy Grail of Pinot Noir Six winemakers from Oregon’s Willamette Valley and California’s Sonoma County share their techniques for making premium Pinot Noir in an article published in Wines & Vines. Claire Jarreau of Brooks Wines said, “There can be no hiding mistakes made on the vine or in the cellar; every aspect of the grapes’ transformation into wine is expressed. However, this transparency makes Pinot Noir a great storyteller and highly rewarding for those that enjoy the challenge.” https://www.winesandvines.com/features/article/197069/Seeking-Perfection-in-Pinot-Noir. Foley Family Wines Acquires Acrobat Label Acrobat, King Estate’s value brand, was purchased for an undisclosed sum. Acrobat produces about 156,000 cases annually of Pinot Gris, Pinot Noir, Rosé of Pinot Noir and Chardonnay and the wines are ubiquitous in the US marketplace. Foley already owns The Four Graces in the Dundee Hills of Oregon. Native Yeast Versus Cultured Yeast An informative online article appeared on the blog, Reverse Wine Snob. Under the blog’s Ask The Expert series, winemaker Erica Stancliff discusses the role of native yeast and cultured yeast in winemaking. Visit https://www.reversewinesnob.com/native-yeast-versus-culturedyeast- in-winemaking. 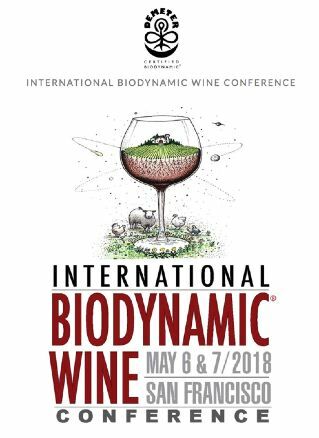 International Biodynamic® Wine Conference Demeter USA hosts the first International Biodynamic® Wine Conference (IBWC) in the US, May 6-7, 2018, at the Golden Gate Club in San Francisco. May 6 is the Biodynamic Producer Day Program, May 7 is the Trade & Media /Day Program and Grand Tasting and May 7 is also a Party & Consumer Grand Tasting (open to all). More than 40 wineries from three continents will be pouring at the two IBWC Grand Tastings. Many notable Pinot Noir producers will be pouring including Brooks, King Estate, DeLoach Vineyards, Sea Smoke Estate Vineyards, Analemma Wines, Brick House Vineyards, Johan Vineyards, Keeler Estate Vineyard, Radio-Coteau, Westwood Estate Winery, Winderlea. No Burgundians are participating. Visit www.biodynamicwineconference.org. CorkGuru This is a new restaurant wine list app for the iPhone. It is the first restaurant-focused wine app. Diners are able to review the restaurant’s wine list before going or peruse it on an iPhone while at the table. Restaurants can upload their inventory to the app so the information is current. Restaurants can also promote certain wines. Getting Your Money’s Worth! I looked at the latest April issues of four major wine publications: Wine Spectator, Wine Enthusiast, Wine & Spirits and the Oregon Wine Press. Of course, advertising provides the backbone of profitability for wine magazines, but it was surprising to see how much advertising is in each issue. Wine Spectator: 140 pages, 56 full pages of ads (40%) and 17 pages of partial ads. Wine Enthusiast: 138 pages, 28 full pages of ads (20%) and 2 pages of partial ads. Wine & Spirits: 146 pages, 25 full pages of ads (17%) and 6 pages of partial ads. Oregon Wine Press: 59 pages, 19 full pages of ads (32%) and 3 pages of partial ads. Most ads are wine-related except in Wine Spectator which also has ads for whiskey, cars and cruise lines among others. The PinotFile: 25 pages, 0 ads. The only thing holding domestic Pinot Noir back is pricing. Willamette Pinot Noir wines averaged $75 a bottle, while California wines averaged $84 from the Central Coast and $94 from the North Coast. The top 10 most popular restaurant Pinot Noirs: Cristom Jefferson Cuvée, Domaine Drouhin Dundee Hills, Belle Pente (Willamette Valley, Belle Pente Vineyard, and Murto Reserve bottlings), Flowers Sonoma Coast, Friedrich Becker Pflaz (Germany), Patricia Green Cellars Willamette Valley Reserve, Failla Sonoma Coast, Adelsheim Vineyard Willamette Valley, Evesham Wood Willamette Valley, and JK Carriere Willamette Valley Provacateur. Other popular Oregon Pinot Noirs were Teutonic Wine co., St. Innocent, Angela, Eyrie Vineyards, Walter Scott, Archery Summit, Soter, Omero Cellars, Elk Cove, Erath, and Penner-Ash. Other popular California Pinot Noirs were Joseph Phelps Freestone, Emeritus, La Crema, Anthill Farms, Belle Glos, Tatomer, Meiomi, Williams Selyem and Littorai. 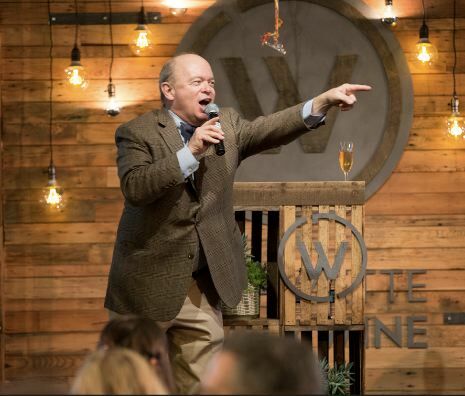 Evenstads pledge $6 Million to Linfield College Wine Program The founders of Domaine Serene, Grace and Ken Evenstad, pledged the largest gift in Oregon history to allow Linfield College to expand its wine education. program. Linfield College already offers the first interdisciplinary liberal arts bachelor’s degree in wine studies in the US. The generous gift will endow the Grace and Ken Evenstad Center for Wine Education at Linfield, and an endowed faculty position, the Evenstad Chair in Wine Studies. Taste Dundee The Fourth Annual Taste Dundee Celebration will be held Saturday, April 28, 2018, at Dobbes Family Estate in Dundee, Oregon, as part of Oregon Wine Month. 20 Dundee wineries will be pouring along with local eats and live music. 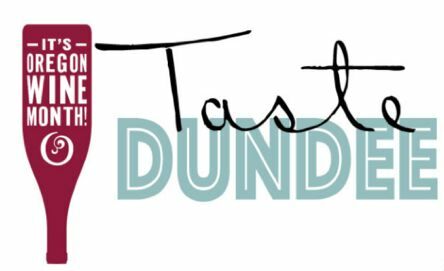 Visit the website for information and tickets at www.tastedundee.com. Research from ETS Labs on Smoke Taint Dr. Eric Hervé of ETS Laboratories has presented his latest work on smoke taint studies that the ETS team has conducted since the California fires of 2008. Research on smoke taint from 2003-2007 revealed that volatile smoke compounds could be absorbed by grapes and leaves and become attached to sugars (“glycosylated”). During fermentation, the compounds are freed from their sugar attachment and cause smoke taint to appear in wine. Labs, such as ETS, developed marker compounds to estimate the risk of wine smoke taint, specifically guaiacol and 4-methylguaiacol. Results from the 2018 vintage showed that the final concentrations of free guaiacol in wines were only on average 1.6 times higher than the concentrations measured in grapes at harvest indicating the risk of smoke taint was lower when fire events happened earlier in the season. Dre. Hervé found that washing the grapes and reducing the maceration time for red wines did not reduce smoke taint. There is no effective treatment of smoke taint in wine at this time, although reducing the number of leaves that make it through sorting may have limited value. https://blog-en.fruitionsciences.com/2018/04/10/ets-smoke-taint/.